Officials confirm first Ebola case diagnosed in U.S.
DALLAS -- Federal health officials on Tuesday confirmed the first case of Ebola diagnosed in the U.S., a patient who recently traveled from Liberia to Dallas and a sign of the far-reaching effect of the out-of-control epidemic in West Africa. The unidentified patient was critically ill and has been in isolation at Texas Health Presbyterian Hospital since Sunday, officials said. Health authorities have begun tracking down family and friends who may have had close contact with the patient and could be at risk for becoming ill. But officials said there are no other suspected cases in Texas. At the Centers for Disease Control and Prevention, Dr. Tom Frieden said the patient left Liberia on Sept. 19, arrived the next day to visit family and started feeling ill four or five days later. He said it was not clear how the person became infected. Frieden said there was no risk to anyone on the airplane because the patient had no symptoms at the time of the flight. "The bottom line here is that I have no doubt we will control this importation, or this case of Ebola, so that it does not spread widely in this country," Frieden told a news conference. "It is certainly possible that someone who had contact with this individual, a family member or other individual, could develop Ebola in the coming weeks," he added. "But there is no doubt in my mind that we will stop it here." Frieden updated President Barack Obama on the patient and the public health investigation, the White House said. Frieden said he believed the case also marked the first time this strain of Ebola has been diagnosed outside West Africa. Four American aid workers who became infected while volunteering in West Africa have been flown back to the U.S. for treatment after they became sick. They were cared for in special isolation facilities at hospitals in Atlanta and Nebraska. Also, a U.S. doctor exposed to the virus in Sierra Leone is under observation in a similar facility at the National Institutes of Health. The U.S. has only four such isolation units. But asked whether the patient would be moved to one of those specialty facilities, Frieden said there was no need and virtually any hospital can provide the proper care and infection control. 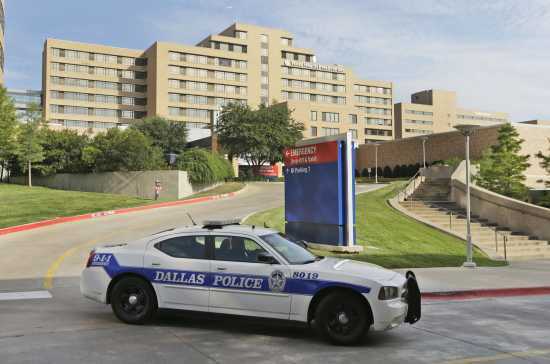 Dr. Edward Goodman, epidemiologist for Texas Health Presbyterian, said the hospital had a plan for handling Ebola should a suspected case emerge and was "well prepared" to provide care. After arriving in the U.S. on Sept. 20, the patient began to develop symptoms Sept. 24 and initially sought care two days later, Frieden said. The patient was admitted to the hospital Sept. 28, when Texas Health Presbyterian put him under strict isolation. Blood tests by Texas health officials and the CDC separately confirmed an Ebola diagnosis Tuesday. Frieden would not reveal the patient's nationality. Asked how many people the patient may have had close contact with in that time period, Frieden said: "I think a handful is the right characterization." Since the summer months, U.S. health officials have been preparing for the possibility an individual traveler could unknowingly arrive with the infection. Health authorities have advised hospitals on how to prevent the virus from spreading within their facilities. People boarding planes in the outbreak zone are checked for fever, but that does not guarantee an infected person won't get through. Liberia is one of the three hardest-hit countries in the epidemic, along with Sierra Leone and Guinea. The epidemic has killed more than 3,000 people in West Africa. Neergaard reported from Washington, D.C.